Technology-Enhanced Learning Outcomes (TELO) is the name of a grant funded by the Ohio Learning Network (Kovalik, 1999). The project was designed to help K-12 classroom teachers integrate technology by having teams of undergraduate education students design and develop technology-enhanced instructional units using existing curriculum topics. Each team of students was paired with a K-12 teacher who selected a curriculum topic. The students were then to develop an instructional unit that integrated technology while matching specified curriculum goals. The purpose of the case study was to investigate the nature and quality of TELO instructional units. The instructional units were examined and critiqued by the technology applications course instructor, an instructional designer, and the respective classroom teacher. The quality of the completed instructional units varied, but overall, the products did not meet intended project outcomes. The instructional units reflected traditional teacher-centered strategies, used technology in predictable, low-level ways, and were disjointed instead of being learner-centered, technologically innovative, and cohesive. Results indicated that undergraduate education students may not have been able to effectively transfer and apply knowledge and skills learned from their education courses to the project and thus were hindered in their ability to produce high-quality technology-enhanced instructional units. Difficulty in transferring knowledge may be due to an educational system that tends to keep courses isolated and separate rather than connected and interrelated. Kovalik, C. (2003). Reflections on a Technology Integration Project. 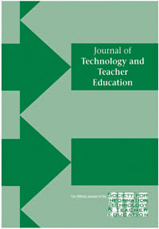 Journal of Technology and Teacher Education, 11 (1), 73-90. Norfolk, VA: Society for Information Technology & Teacher Education. Retrieved April 25, 2019 from https://www.learntechlib.org/primary/p/17789/. Dawson, K., & Norris, A. (2000). Preservice teachers’ experiences in a KReflections on a Technology Integration Project 89 constraints, and implications for teacher educators. The Journal of Computing in Teacher Education, 17(1) , 4-12. Educational Testing Service. (2000). The Praxis series: Professional assessment for beginning teachers. Princeton, NH: Educational Testing Service. Ellsworth, J.B. (2000). Surviving change: A survey of educational change models. Syracuse, NY: Clearinghouse on Information and Technology. Ertmer, P.A. (1999). Addressing first-and second-order barriers to change: Strategies for technology integration. Educational Technology Research and Development, 47(4) , 47-61. Ertmer, P.A., & Hruskocy, C. (1999). Impacts of a university-elementary school partnership designed to support technology integration. Educational Technology Research and Development, 47(1), 81-96. Glennan, T.K., & Melmed, A. (2000). Challenges of creating a nation of technology-enabled schools. In R.D. Pea (Ed. ), The Jossey-Bass reader on technology and learning (pp. 48-79). San Francisco: Jossey-Bass. Kovalik, C.L. (1999). Technology-enhanced learning outcomes. Research and development grant funded by the Ohio Learning Network. Means, B., Blando, J., Olson, K., Morocco, C.C., Remz, A.R., & Zorfass, J. (1993). Usingtechnology to support educational reform. Washington, DC: United States Department of Education, Office of Educational Research and Improvement. Mellon, C.A. (1999). Technology and the great pendulum of education. Journal of Research on Computing in Education, 32(1), 28-35. Parks, A., & Pisapia, J. (1994). Developing exemplary technology-using teachers. Research Brief #8. Richmond, VA: Metropolitan Educational Research Consortium. (ERIC Document Reproduction Service No. ED 90 Kovalik Rath , A. (1999). Using peer teaching and problem solving in pre-service educational technology courses. Journal of Computing in Teacher Education, 16(1) , 25-32. Schrum, L., & Dehoney, J. (1998). Meeting the future: A teacher education program joins the information age. Journal of Technology and Teacher Education, 6 (1), 23-38. Sheingold, K., & Frederiksen, J. (2000). Usingtechnology to support innovative assessment. In R.D. Pea (Ed. ), The Jossey-Bass reader on technology and learning (pp. 320-337). San Francisco: Jossey-Bass. Silver, H.F., Strong, R.W., & Perini, M.J. (2000). So each may learn: Integrating learnings ty les and multiple intelligences. Alexandria, VA: Association for Supervision and Curriculum Development.